The Buddha and Jesus began their journeys on Earth at vastly different times, and came out of vastly different circumstances and cultural challenges. While the spiritual traditions that emerged from the work of these two seminal teachers may seem to have little in common, nothing could be further from the truth! By merely scratching the surface of Buddhism and Christianity, we can uncover many common teachings of Jesus and the Buddha, affording us the opportunity to evolve our spirituality in ways that can better support us through the challenges of the 21st Century. 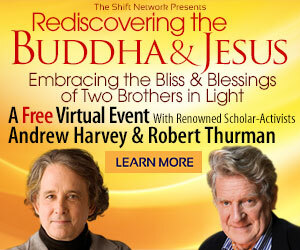 That’s why I’m excited that Andrew Harvey and Robert Thurman are coming together for the very first time to help you deepen your understanding of the wisdom, practices and love offered by both Jesus and the Buddha. I’m pleased to invite you to join these respected spiritual teacher-scholars this Wednesday, August 3, at 5:30pm Pacific, for Rediscovering the Buddha & Jesus: Embracing the Bliss & Blessings of Two Brothers in Light. Andrew and Robert, who are delightful to listen to and learn from, see the Buddha and Jesus as “two brothers in light” who brought greater awareness and love into our world. Combined, the teachings of Jesus and the Buddha offer you a path of truly embodied bliss and blessing. It’s sure to be a riveting hour with these two brilliant, humorous and loving scholars and teachers. Be prepared to receive wisdom and practices that will bring you more grace, love and wholeness! Join us here! PS – Everyone who registers for Rediscovering the Buddha & Jesus: Embracing the Bliss & Blessings of Two Brothers in Light, will also receive the audio recording afterward. This not-to-be-missed event will be sizzling with wisdom, passion and laughter as Robert and Andrew bring alive the Buddha and Jesus in ways you’ve never before heard!